In the middle of the night we lay four or five across on brown paisley bolsters, like sausage links—pigs in a blanket—stuffed into our fiber-filled mummy bags. Suddenly, I sat bolt upright and shouted, “Mom, I hate you!” My brother Matt, sleeping in our trailer’s tiny loft space, heard me, and of course I woke up my mom, dad and four other siblings, too. They said later that I’d flopped right down and went back to sleep, remembering nothing of it the next morning as we all sat down to a fried clam and pancake breakfast. I don’t remember that particular camping week dream, though I do remember that I’ve often dreamt about being bugged to hell by my mom or Matt before waking myself up whining for them to stop. I’ve had recurring dreams, such as the one-haired baby who’s about to be smashed by a gigantic boulder careening down a dark mossy hillside such as those seen in epics filmed in Cornwall, Scotland, Ireland. Then there are the dreams in which I breathe underwater, soaring through the sea as if I were some manta ray, or the dreams where I’m hanging out with my buddy Jimmy Stewart over a cup of coffee or a bourbon, slapping each other on the back talking about old times. I still dream often about pals from my youth, of my best friend Lidia with her platinum hair and eyes full of light and stars, of Craig with his thick dark curls and crackly irises flecked with green and gold, of one of the many swim team boys I used to have a major crush on, all tan and wiry with that gravely pubescent voice. I even have an occasional nightmare about that compulsive liar ex-boyfriend stalking me before trying—unsuccessfully—to coerce me into getting back together with him. And a smattering of my dreams feature other friends and former boyfriends, all of whom—with the exception of the shameless liar dude—are kind, loving and supportive, like best friends should be, and I wake up smiling. But the one person who travels through my sleepy trance most is Calvin. I remember my first dream of him when I was pregnant. In it he was a newborn who’d come into the world with a mop of crazy, curly blond locks (like he had when he was two) and a bucketful of things to say. His words streamed forth from a smiling dimpled mouth already boasting a couple of teeth. 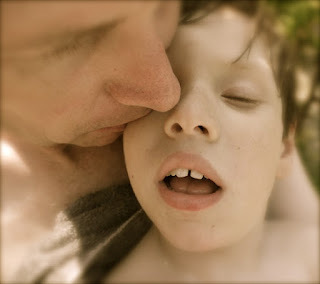 Most often, though, dreams of my son are nightmares in which he is seizing. I know I dream in color because Calvin’s face is blue and, like most dreams, they are indistinguishable from reality until I wake up. I see the seizure, I rush to him, I cannot make it stop then I wake up in a sweat running to his bedside to see if he is okay. Once, I woke up from a dream of Calvin seizing only to find him seizing in his crib. Somehow there must be a way to rewire my dreams—to rewire Calvin’s brain if only in my dreams. Perhaps I can hone the skill of sculpting these dormant shadows of Calvin into shapes of beauty, happiness and peace rather than reliving the terrible reality that is epilepsy again and again in my sleep. If I could, I’d dream of Calvin, Michael and I in a world unknown to us. We’d be swimming in a clear lagoon spooning into a crescent beach, bright white sands dissolving into cyan and indigo, then ribbons of black at the edges. The three of us would float and breathe under water—me and my mermen—our bodies mingling with bands of shiny kelp, the sun glinting off of the water’s ripples like crumpled foil or stardust. We’d beach ourselves and run and run in sinking sand, getting nowhere in the super slow-mo of dreams, except we wouldn’t be worried or panicked. We’d be blissful—floating—the breeze winding through our ropey hair, our faces toward the sun. We’d be golden—our boy perfect, skipping down the beach kicking up sand and talking up a bucket full of words, ideas. Then we’d swaddle him close and kiss him until the next day’s sun came up. We’d fall asleep in the cool dawn and never—ever—awaken from that dreamscape.